I wanted to make something instant as I was super hungry and did not feel like having bread for breakfast and as I am alone for lunch, did not feel like making a meal. So this dish was great for brunch and it is healthy too. 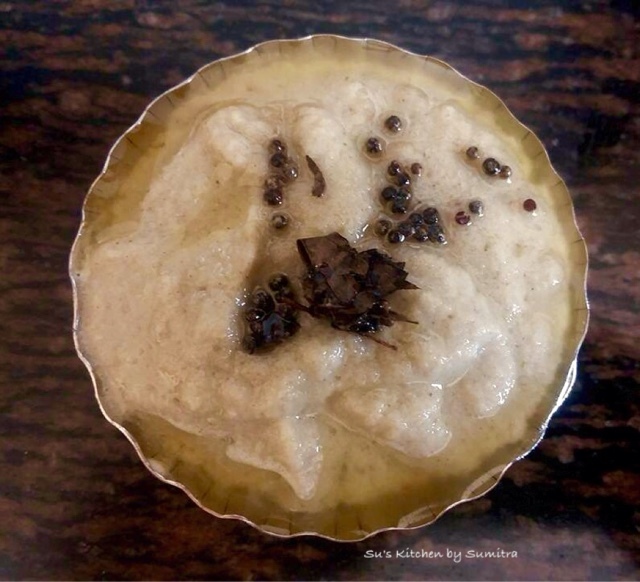 So here is the recipe of how I made this Instant Dosa with mix lentils and semolina..... which is served with spicy Turnip and Coconut Chutney. Wash all the lentils together and soak it for 15 minutes. Take a grinder and grind the lentils and salt together into a smooth paste. Add the sago flour, semolina and some water. Make it into a medium thick batter. Remove it into a mixing bowl. Add Eno and mix it. 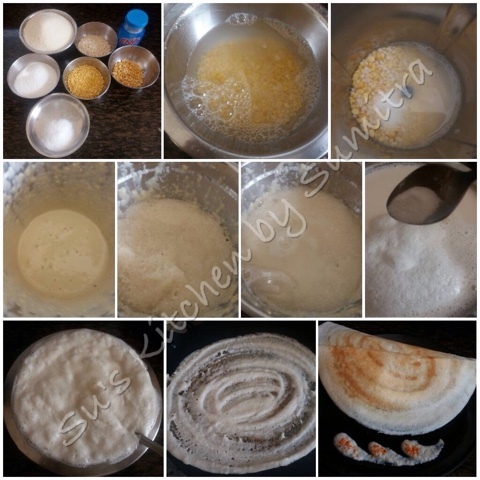 The batter is ready for making dosas. 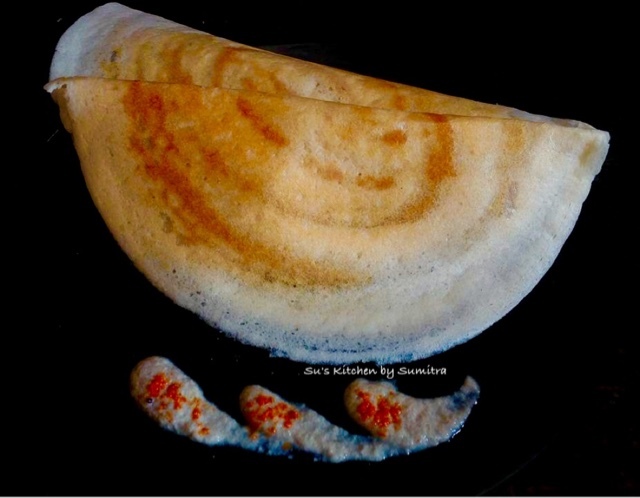 Take a dosa skillet. Let it heat on low flame. Add 2 ladles of the batter. Spread it and drizzle some ghee. Let it cook on low flame until crispy and brown. Serve it hot with the turnip and coconut chutney. In a grinder, grind all the above ingredients except curry leaves, mustard seeds and oil into a thick paste. Take a small pan. Add oil, let it heat. Add the mustard seeds and curry leaves. Let the mustard seeds crackle. Add the seasoning into the chutney. This is a sour and spicy pickle made with very tiny fish found in the stream, river or pond. I absolutely love this pickle and goes well with dal, aloo bhate or borta and hot rice. This is an experiment in my kitchen. Add all the above ingredients in to a grinder and add little water to make it into a smooth paste. 500 grams Ganges River Spratt washed well and dipped into hot water for few seconds and drained the water out. Take a wok, add oil and heat it up. Once hot fry the fish till crispy. In the same oil add panch phoran, ginger, garlic and chillies. Sauté it for 2 minutes. Add the wet paste and 2 tbsp water. Stir and cook the paste for 2 minutes. Add the fish, let it cook till the oil starts to separate from the paste. Add the vinegar and 2 tbsp raw mustard oil. Stir and let it cool. Store it in a dry clean bottle and store it in the refrigerator for 6 months. Some Donuts for the evening... I hope you all enjoy the twist.. 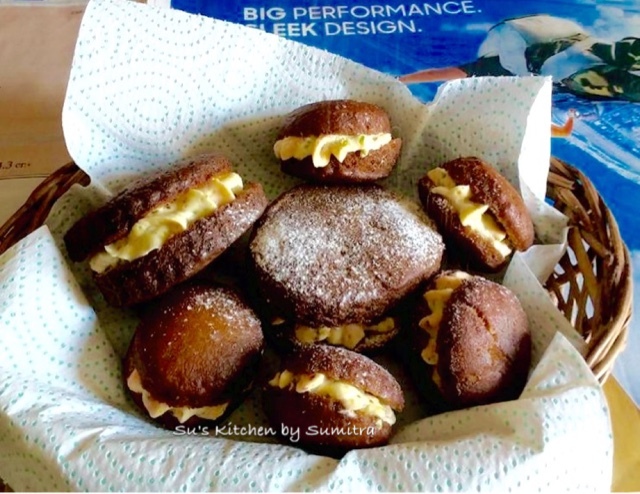 These donuts are made with whole wheat flour, oat flour, brown flatten rice flour and pomegranate juice. 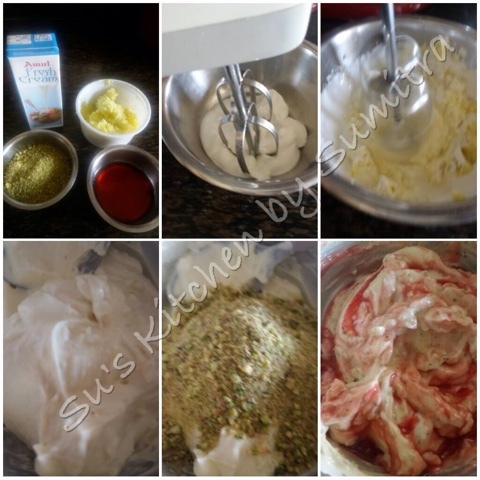 The filling is made with hung curd, Amul cream, rose syrup and crushed pistachios. This is a good snack for children. This is an experiment in my kitchen. For the Rose Pistacho Cream.. In a mixing bowl, beat the cream. As it thickens up, add the hung curd and beat it well. Add the ground pistachio, fold the cream with a spoon. Add the rose syrup and gently just mix it once. 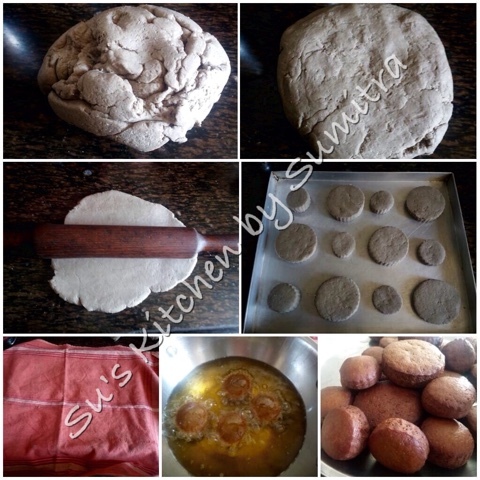 Sieve whole wheat flour, all purpose flour, oat flour and flatten rice flour together. All all the flour, 50 grams powder Sugar and milk powder together. Take the pomegranate juice and make it lukewarm. Add 1 tbsp powder sugar and yeast. Let it rise. Add the yeast water into the flour. Start to make a dough. Add the butter and water and knead it for 10 minutes. Cover it and let the dough rise. Knead the dough again and keep it on a flat surface. Roll the dough into a thick sheet with a rolling pin. Take a donut cutter or a round cutter and cut out the donuts. Cover and keep till it rises. Heat oil. Fry the donuts till golden brown. 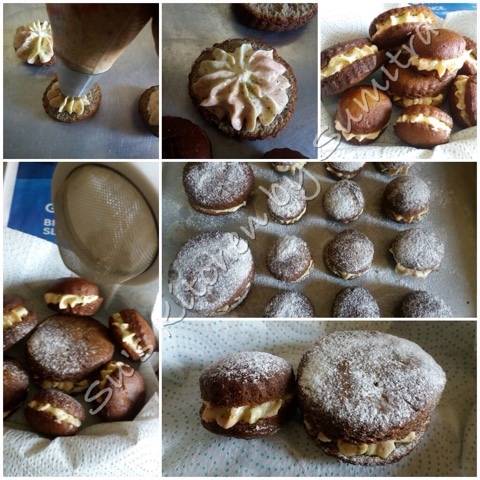 Once it has come to room temperature, cut the donut into half horizontally and add the cream in the centre with the help of a piping bag and a big nozzle. Sprinkle powder sugar from top. This is an easy recipe for fish lovers. 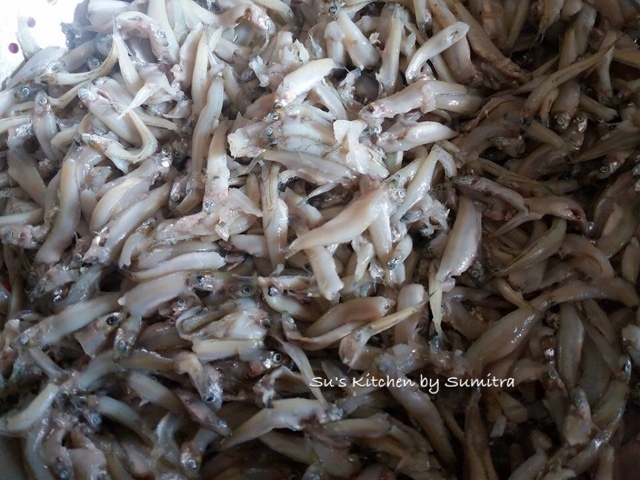 There are many Bengali dishes made from Bombay duck like Jhuri Bhaja, Bhorta, Loitta Maccher Tarkari etc. 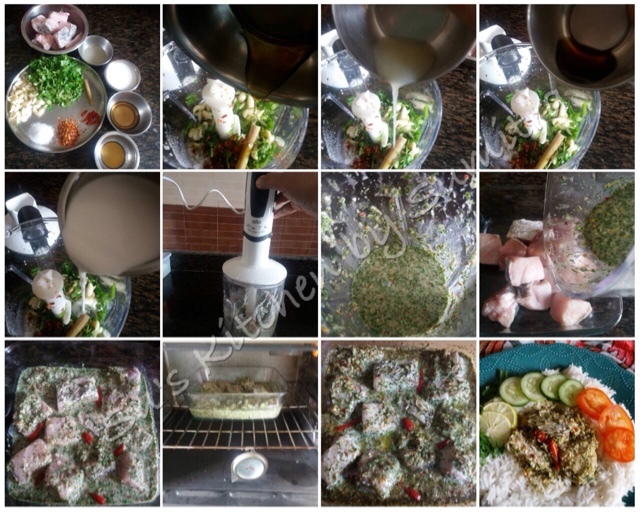 Here is a bit different preparation which is an experiment in my kitchen. This dish can be a good accompaniment with hot dal and rice during lunch or with evening tea. Serve it crispy and hot. 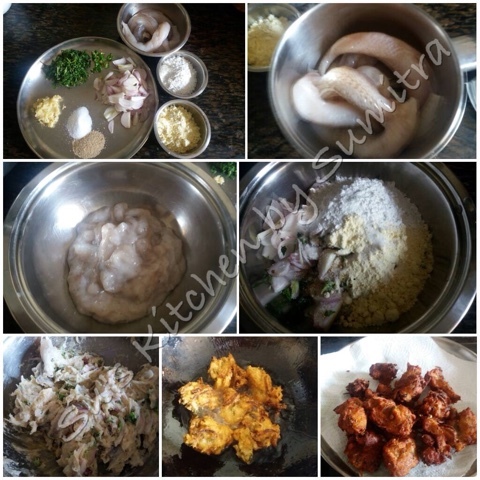 I am sure you will enjoy this simple Bombay Duck Fritters..
Take a grinder and grind the Bombay ducks into a paste. Pour the paste into a mixing bowl. Add the other remaining ingredients except for the oil and gram flour into the mixing bowl. Add the gram flour little at a time while mixing. Mix all the ingredients very well. The batter will be thick and should not be of dropping consistency. Pour oil in a wok. Let the oil heat up. 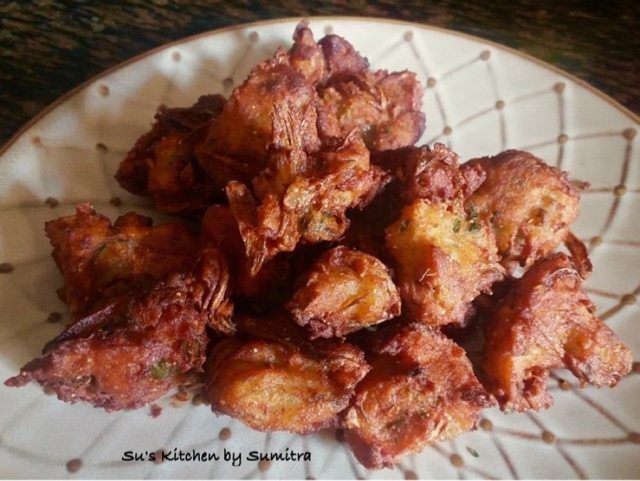 Add the fritters into the oil and fry it till golden brown in colour from all the sides and crispy on a medium low heat. Serve it hot. 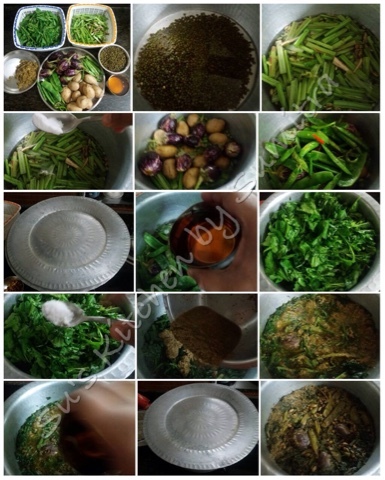 This is an old traditional dish prepared particularly when any member of the house is sick or if you want to cool your stomach down or prepared if anyone is in a hurry or travelling. This dish is loaded with vegetables and fish. It has a thin gravy / Patla Jhol. If you are unwell make this dish with less spices, more liquidy and avoid deep frying the fish. 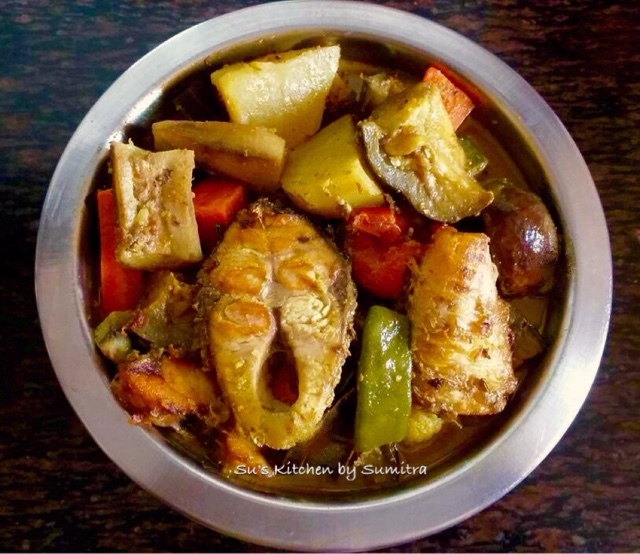 In Bengali cuisine as each dish has a different style of cutting the vegetables, in this dish the vegetables has to be cut big in size, in wedges or in big pieces and all the vegetables cut has to be in the same proportionate size. 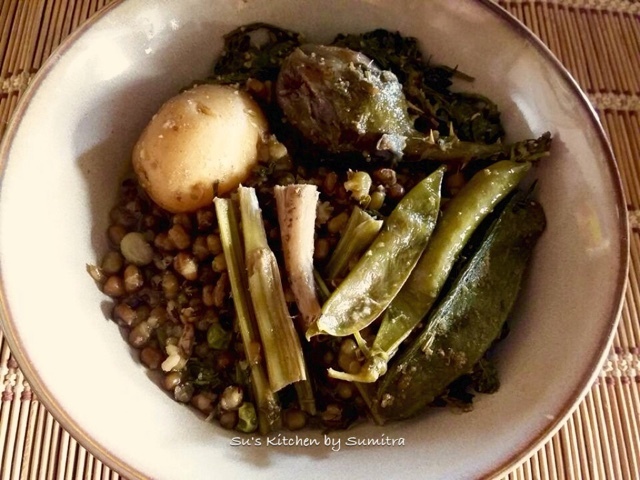 Any seasonal vegetables can be added like pointed gourd, raw banana, cauliflower, carrot, French beans, flat beans, potato,tomato, drum stick, raw papaya etc. 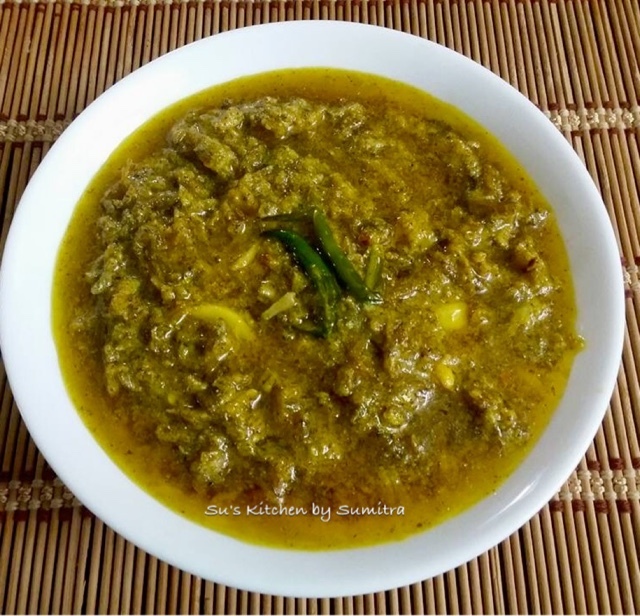 Urid dal bori is fried and is also added to the Jhol. Apply 1/2 tsp turmeric powder and salt to the fish and keep it to marinate for 10 minutes. Take a wok, add oil. Let it heat well. Add the fish into the oil and fry it on both sides till brown in colour. Remove and keep it aside. Remove the excess oil and leave 3 tbsp oil in the wok. Add Panch phoran, bay leaves and green chillies. Wait till the Panch phoran crackles. Add the ginger paste and sauté it for a minute. Add all the vegetables, stir and sauté it for 2 to 3 minutes. Add the salt and all the powder spices. Stir and cook for another minute. Add about 1 and 1/2 litres of water. Stir, cover and cook till the vegetable are almost tender. Now add the fried fish. If you are adding fried boris add it with the fish. Cover and cook for another 2 minutes. Serve it hot with hot steaming rice and lime wedges. 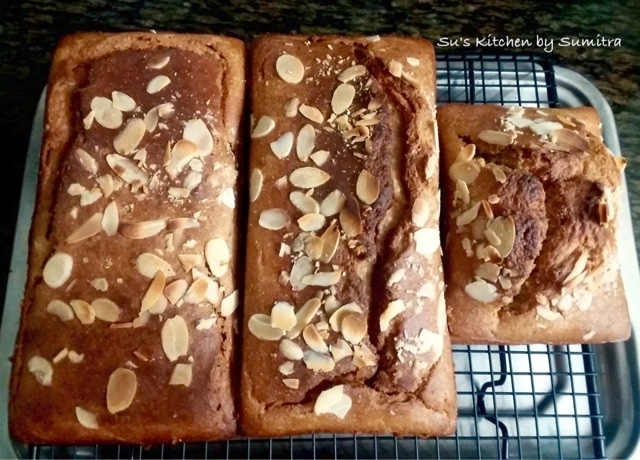 This is a very easy vegetarian rustic tea time cake loaf. 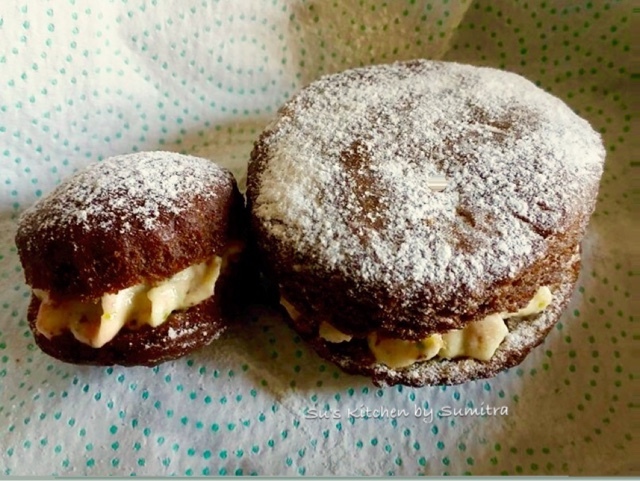 I had few bananas which had completely ripped and that went into the batter along with the other ingredients. 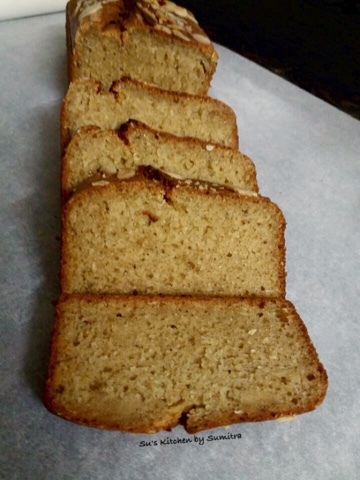 Love the flavour of coconut and banana in the cake. 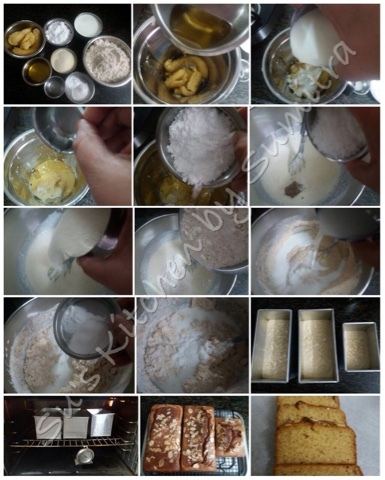 Add the bananas, oil, butter milk, powder sugar and coconut essence into the blender. 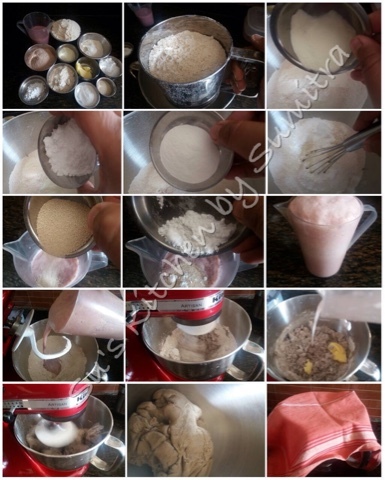 Blend the ingredients until smooth. Pour the batter into a mixing bowl. Add the cardomom powder and desiccated coconut. Beat it well. Add the semolina and beat it again. Add half of the whole wheat flour and 1/2 of the milk. Beat it again. Now add the rest of the flour, milk, baking powder, soda bicarbonate and salt. Beat it well. The batter should be thick dropping consistency. Add more milk if required to get the right consistency. Take 2 and a half loaf tins. Grease the baking tins. Fill in the batter into each tin till the tin is half filled. Sprinkle some almond flakes on the top. Bake it at 180 degrees celcius for 45 to 50 minutes or until done. 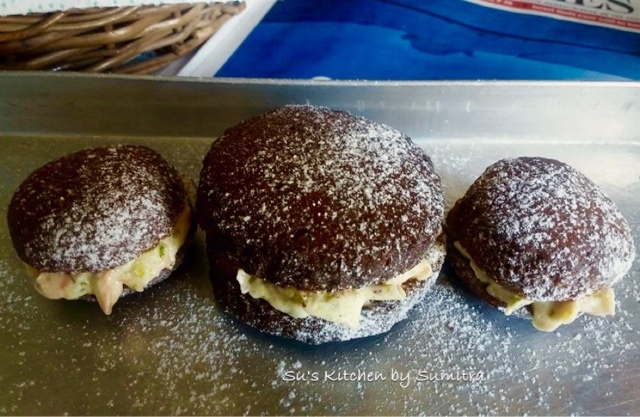 Remove the cake loafs from the oven and cool it completely before slicing. This dish is adapted from Thai cuisine... It's a baked dish and without oil. So definitely a healthy dish. 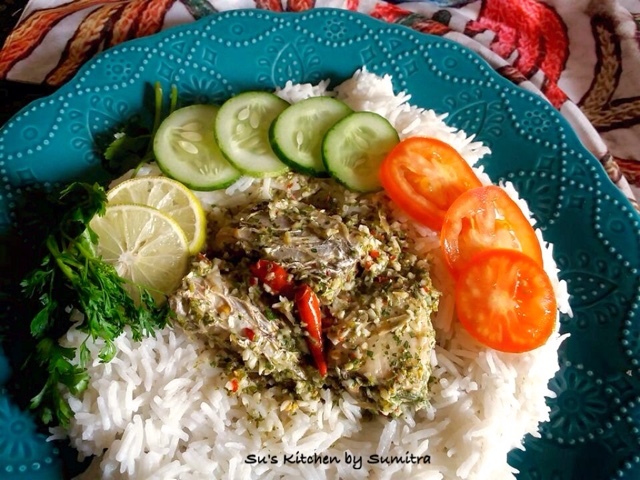 Serve this dish with green cucumber, tomato and rice and enjoy the flavour of garlic, coriander and coconut. Take a chopper, add the coriander, garlic, lemongrass, chilli flakes, fish sauce, lemon juice, honey, salt and coconut milk. Pulse it 3 to 4 times. Take a oven proof baking dish. Place the fish into the baking dish. Pour the mixture on the fish and mix well. Add the chillies. Bake it in a preheated oven for 10-15 minutes at 200 degrees celcius or until fish is cooked well. Garnish with coriander leaves, cucumber slices, tomato slices and lemon slice. Gota Sheddho is made on the day of Saraswati Puja in Bengal and eaten the next day that is Sheetal Shasti. Gota means whole and Sheddo means boiled. 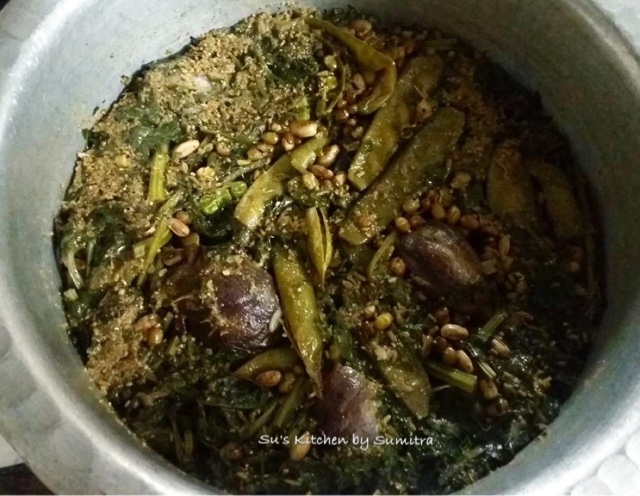 It is made with 5 types of vegetables, spinach with stem and roots (shish palak) and whole mung dal or whole black lentils. Each of the vegetables are taken in odd number like 5, 7, 9 or 11. Different household has different version of making Gota Sheddho. In some houses, they have it only boiled and some houses makes mashala gota sheddho. 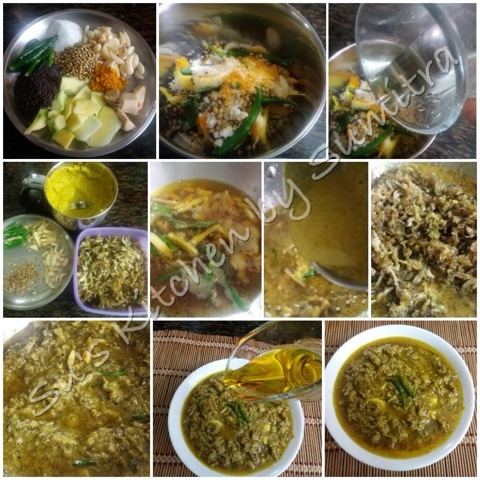 I tried keeping my mother's traditional way of making mashala gota sheddho. It is normally eaten with panta bhaat. Take the shish palak. Cut the stems into 1 inch pieces, the roots are also cleaned and add to the stem, the leaves are cut into pieces and kept separately. Give a slit on the potatoes and brinjals. Take a deep bottom pot. Add 2 liters of water. Add the dal. 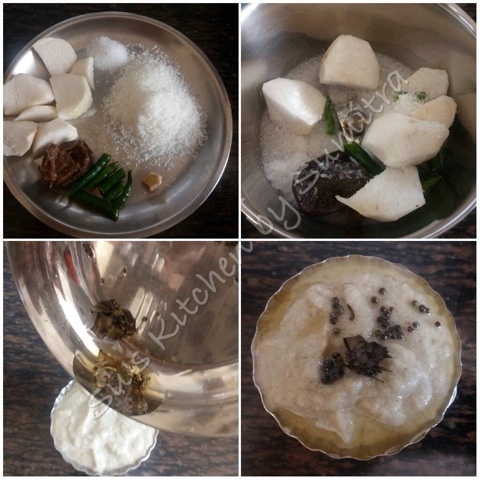 Arrange the stem and the roots of the palak, sprinkle some salt, then arrange potatoes followed by brinjals. Then add the flat beans, green peas and chillies. 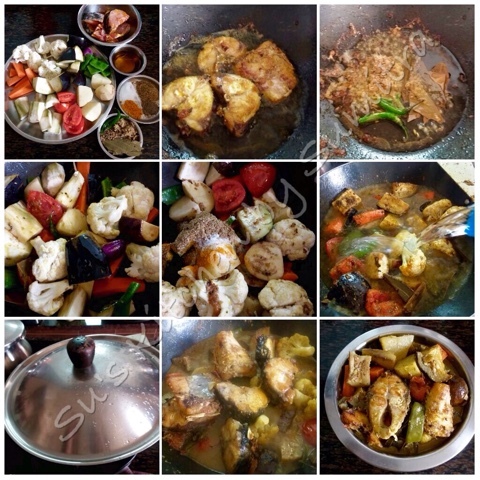 Cover the pot and let it simmer on low flame till the ingredients are 50 percent cooked. Add half of the mustard oil. Now add the Palak leaves and sprinkle some more salt. Cover and let it simmer till the dal is cooked. Take the ginger and fennel seed paste in a bowl. Add 1/4 cup water to it. Pour the paste on the gota and add some more mustard oil. Cover and cook for another 10 minutes. Lastly drizzle the remaining mustard oil and keep it over night. Enjoy the gota for lunch.